The peregrine falcon — a species that once was endangered — is now thriving across the Midwest in urban landscapes like Evanston’s 1st Ward. 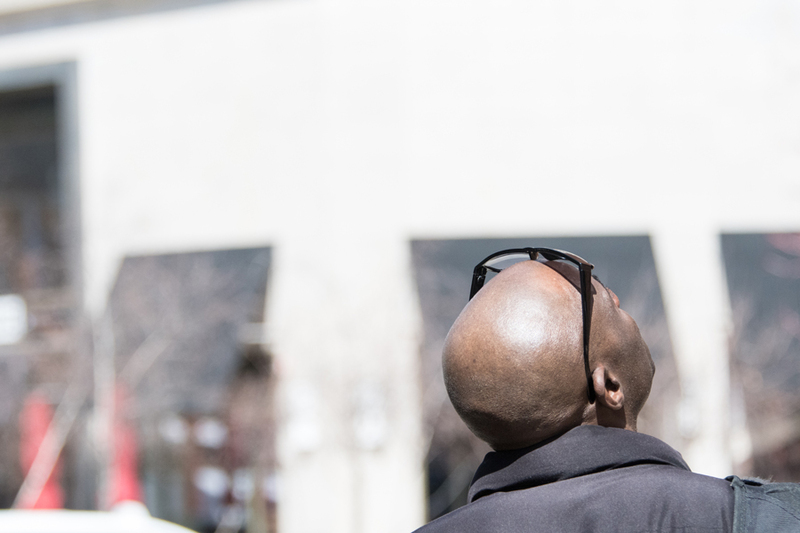 Since 2004, the falcons have taken to building their nests at Evanston Public Library, drawing widespread attention from gawking pedestrians and even garnering a heavy media following. A perennial webcam trained on the nest has more than 180,000 views. Squawker and Fay, who are on their 13th and second seasons at EPL, respectively, are the nest’s current occupants. The two are nesting four eggs, which are expected to hatch this week. As of Tuesday morning, all were still intact. The pair is looking to successfully raise their young after a tragic season in 2017. Last year, the pair did not succeed in fledging any young. This season has brought some changes for the lovebirds. With their nest, known as a scrape, situated at a new location, the two peregrines seemed to be having a tough time deciding where to stay. Mary Hennen is the assistant collections manager at the Field Museum in Chicago and works with the Chicago Peregrine Program, which oversees Illinois’ peregrine falcon population. Hennen said the falcons are cliff-dwellers, and she cites their adaption to the urban environment as an essential part of the species’ recovery from endangerment. “The peregrine’s adaptability to the cities is what has helped the recovery be so swift,” Hennen said. Schacter has worked at EPL for five years and said there is a special bond between the library and the feathered friends. “We are their rocky cliff,” Schacter said. A pedestrian looks up at the pillars of Evanston Public Library. The peregrine falcons are known to frequent the Evanston downtown area, where the library is situated. Such a bond between human and peregrine is no rarity in Evanston. Locals have been drawn to the falcons throughout their 14 years in the city, fledging a close-knit community of avid aviary onlookers. 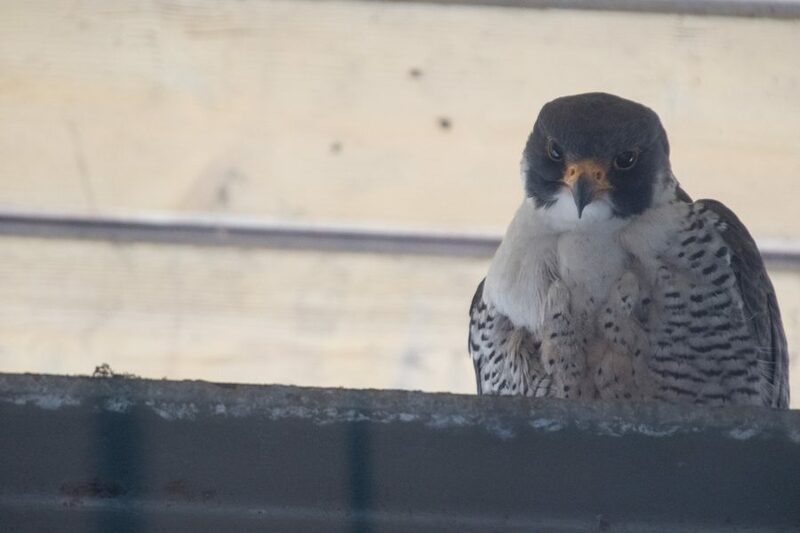 Evanston resident Deborah Cohen has volunteered with birds of prey for many years and recalled the first time she saw peregrines in Evanston: She was standing on top of the Whole Foods parking lot and noticed falcons nesting on the library in 2004. “From that point on, I was committed to watching these falcons,” Cohen said. That year, Cohen found a community of residents who would also wake up early just to watch the birds in the morning. Flash forward a few years and Cohen started the Evanston Peregrine Falcon Watch, a “friendly forum for exchanging news and observations about the library Peregrine Falcons of Evanston” on Yahoo Groups. Once the peregrine eggs hatch and the eyasses grow up, group members will take shifts on “fledge watch,” where members are “on hand” to observe each bird’s first flight, Cohen said. This seven-to-10-day period focuses on ensuring the safety of the fledglings as they tend to lose altitude after take-off. Cohen said the group is always looking for volunteers in the area to pick up a shift to watch for the birds. There have been many different species of falcons in Evanston over the years. These birds are known to dive through the skies at high velocities to catch prey. In what is called their hunting dive or “stoop” they can reach a top speed of up to 200 mph, making the peregrine the fastest animal in the world. These ferociously fast birds tend to stay in Evanston through early summer once the eyasses hatch and develop. EPL will also hold its annual banding ceremony shortly after the hatching, in which the baby falcons will be banded to help track the species. If the eggs hatch this week, the banding will likely be during the week of June 4, although EPL has not set a date, Schacter said in an email to The Daily. Schacter added that people can send in submissions via email to help choose names for the new peregrines. Cohen said Evanston residents are aware of and excited about their feathered neighbors. Correction: Due to incorrect information from the Chicago Tribune, a previous version of this story misstated how many eyasses survived by the end of last spring. The falcons did not fledge any young in 2017. The Daily regrets the error.